Back when I was serving as a Chabad emissary at Oxford University, the great British philosopher Isaiah Berlin, who had befriended me, once told me that while he admired my work bringing Jewish students closer to their tradition, he was utterly opposed to the large menorah I erected in the city center each year. “My cousin” — by which he meant his relative, the Lubavitcher Rebbe, Menachem Mendel Schneerson — “is a missionary. But this is not our country, and we have no right to impose our religion on its citizens.” Sir Isaiah was voicing the discomfort felt by some with Chabad’s high-profile Jewish outreach. Indeed, for all its outstanding work, and even as it slowly assumes a position of mainstream world Jewish leadership, the Chabad–Lubavitch movement surprisingly still arouses suspicion, even among many of those it serves. The refrains are common: Aren’t Lubavitchers a little bit too idolatrous in their hero-worship of the Rebbe? Haven’t many crossed a line in their messianic zeal and insistence on the Rebbe as the messiah? And aren’t they contemptuous of non-Jews and American law, as evidenced by the recent Agriprocessors trial? I am necessarily defensive on the subject. Chabad has been the love of my life since I was 10 years old. I gravitate toward its passion for Judaism, its emphasis on love for every Jew and its members’ preparedness to spread their movement’s message throughout the world, often at great personal sacrifice. That does not mean that in the intervening period I have not come to see some of Chabad’s shortcomings. I would prefer that there was less pressure toward conformity, however subtle, in a movement in which people dress alike and often think too much alike. And I wish that Chabad more fully embraced the Rebbe’s own outreach to non-Jews in spreading the light of Jewish values. This, in particular, is a sore point with me since my own falling out with the Chabad leadership in Britain centered around the thousands of non-Jewish Oxford students who had joined my L’Chaim Society. But none of this has diminished my enthusiasm for the Chabad movement, which I view as the great hope for the Jewish future. And it is high time that Jewish officialdom got beyond its suspicion and showed some real appreciation for Chabad’s work. Yes, Chabad messianism is deeply misguided, and many within the movement regard it as a source of embarrassment. But it is mostly benign. For me, the people in Chabad who believe the Rebbe is the messiah do so largely as an expression of deep emotional attachment to the memory of a leader who was irreplaceable. The messianists cause discomfort, but they advocate no changes whatsoever in Jewish law or practice. So are they really bothering anyone, or is this just another cudgel with which to knock a movement whose tremendous growth has fostered no small amount of resentment? To be sure, the Rebbe-as-messiah notion does not appeal to me in the slightest, and I personally welcome an emphasis on the Rebbe’s humanity rather than his saintliness. I never tell stories of his alleged miracles. It was his righteousness as a man that inspired me. And the Rebbe struggled far more than his followers are prepared to let on. He often spoke of his predisposition toward melancholy. He loved his wife deeply and never fully recovered from her loss. The deaths of Israeli soldiers made him heartsick, and toward the end of his life he feared that short of the advent of the final redemption, his work had been in vain. But human frailty for me is not a liability but a virtue. The Rebbe-as-man is far more compelling than the Rebbe-as-superman, and I predict that in the next few years Chabad scholars will go beyond the myth, and we will see portrayals of the Rebbe that capture him in all his flesh. Rather than be diminished, his universality will be established by this change. He will cease being the Rebbe of Lubavitch and will instead become Rebbe of the Jewish world. And why? Because what the Rebbe understood more than anyone else is that ideologies are perpetuated through charismatic leadership. To most people today, Judaism is simply not compelling. So we keep searching for ways to make synagogues and Jewish classes more interesting, forgetting all the while that it’s not the subject which is boring but rather that many of the teachers seem lifeless. The Chabad model of charismatic leadership is the single most important ingredient in its success. While most Jewish kids are playing Nintendo Wii at 13, Chabad youth are on the streets of Sydney and Los Angeles asking people if they are Jewish. Do you know what it takes to ask someone, when you are a foot shorter than they are, if they would like to put on tefillin or light a menorah? It’s torture. But you get beyond your shyness, and after doing it for a couple of years, what emerges is a bold and confident personality that is ready to go out to, say, Baton Rouge, La., and erect a menorah right there in the heart of Dixie. If you can plant the flag of Judaism in some far-off corner of the world where you look funny to most of those watching, let’s just say that by that time you have a pretty sturdy identity, and it is inspiring to all those around who struggle with who they are nearly every day. That is something that the Rebbe understood, even as some of Oxford’s greatest minds missed it. 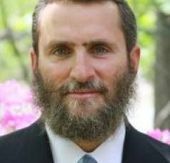 Rabbi Shmuley Boteach is the founder of This World: The Values Network and the author, most recently, of “The Blessing of Enough: Rejecting Material Greed, Embracing Spiritual Hunger” (Hospitality House) and “The Michael Jackson Tapes: A Tragic Icon Reveals His Soul in Intimate Conversation” (Vanguard Press). This story "The Great (and Imperfect) Hope That Is Chabad" was written by Shmuley Boteach.